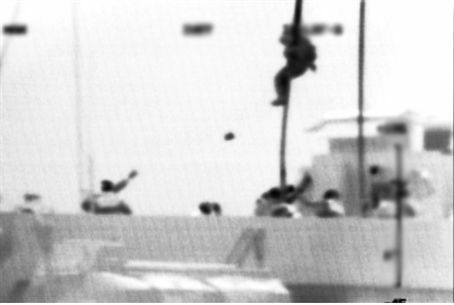 An IDF video clearly documents the flotilla’s Muslim radicals’ brutal attacks with metal clubs on Israeli Navy commandos. An IDF video clearly documents brutal attacks with metal clubs by the flotilla’s Muslim radicals on Israeli Navy commandos. The video shows that the “peace activists” were trained in terrorism and tried to kill the soldiers before Navy officers issued an “open fire” order. The soldiers were under orders not to shoot, but the “open fire” command was given after stun grenades failed to disperse the attackers. Nine people were killed, most of them from Turkey, where the radical IHH group organized the flotilla.